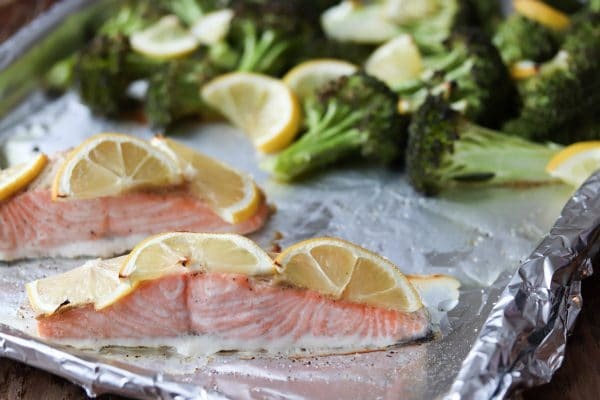 Lemon Dijon Sheet Pan Salmon with Broccoli is an easy cleanup, healthy low carb dinner recipe! If you’re watching your carbs and/or eating clean then this recipe is for you! Not only is this sheet pan salmon a great meal for the work week it’s great for meal prep too. I’ve doubled the recipe and prepared workweek lunches for myself. As a result all I have to do is pull a container out of the fridge in the morning and bring it to work with me. Hopefully my co-workers don’t mind the smell of salmon. Teehee. I buy salmon and other seafood from sizzlefish.com. They offer a great variety of sustainably sourced seafood. I have a monthly subscription and am able to choose the items for my box. Typically I get salmon, haddock and scallops. However, sometimes I like to change it up and get other fish. One time I got rainbow trout. We smoked it on our smoker. It was SO good! Please note, this post is NOT sponsored. I just love Sizzlefish and enjoy helping you by sharing sources of good quality food. 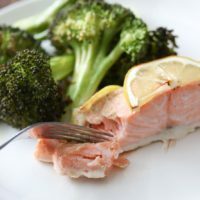 Lemon Dijon Sheet Pan Salmon with Broccoli is an easy cleanup, healthy low carb dinner recipe! If you're watching your carbs and/or eating clean then this recipe is for you! Preheat oven to 400 degrees. Prep a large baking sheet - cover with parchment paper or aluminum foil. Place the broccoli florets on the prepared baking sheet. Drizzle with 1 tbsp of extra virgin olive oil. Sprinkle with desired amount of kosher salt and pepper. 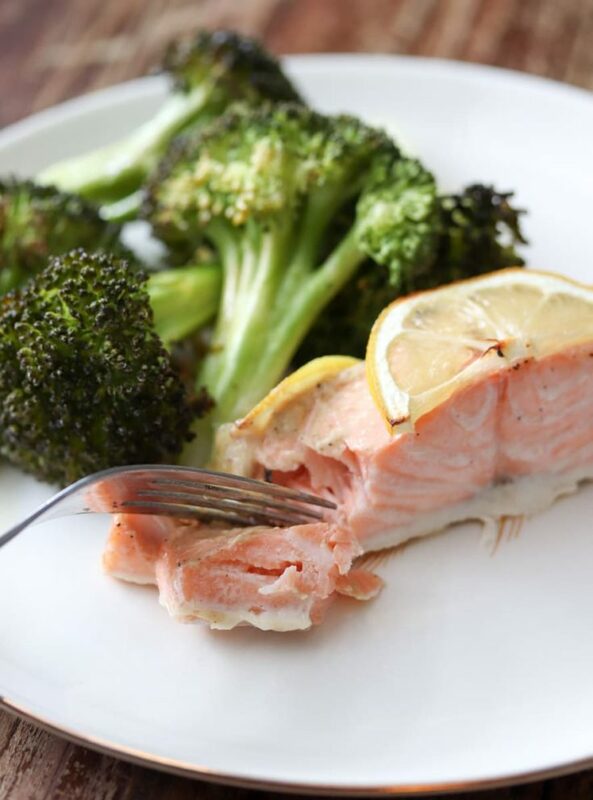 Mix together to coat and arrange the broccoli to cover 3/4 of the pan to leave room for the salmon. Place the lemon slice quarters over the broccoli. Place the salmon skin down on the baking sheet. Drizzle each piece with 1/2 tbsp of avocado oil (or oil of choice). Sprinkle with desired amount of kosher salt and pepper. Spread 1 tsp dijon mustard on top of each salmon piece. Place 3 lemon slice halves on each piece of salmon. Did you make this recipe? I’d love for you to leave a comment and a rating below! I just LOVE salmon. This looks so yummy. Pinned. I love Salmon and this recipe sounds so good. We are trying to eat healthier and this looks like a good recipe for that. Also thank you for the reference to sizzlefish.com. I had never heard of them and it looks like a good place to try. Thank you for sharing at To Grandma’s House We Go. A lovely and healthy meal! Thank you for sharing over at Fiesta Friday! That is a beautiful piece of salmon! Thanks for sharing at the What’s for Dinner link up! 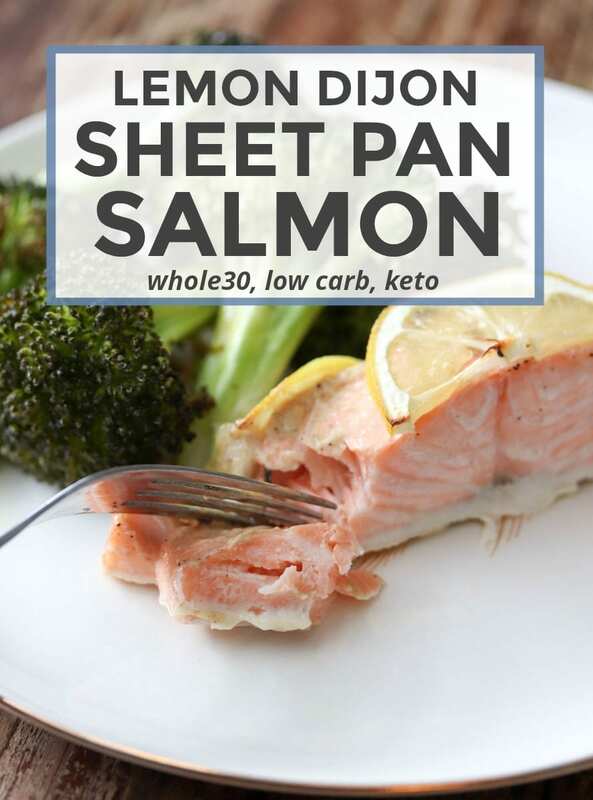 We will love your Sheet Pan Salmon, it looks awesome! Hope you are having a great weekend and thanks so much for sharing with us at Full Plate Thursday! Looks very yummy! Thanks for sharing with SYC.